The highly dynamic and competitive vendor landscape of the global blood pressure monitoring devices sees a good control of some large international companies that have the resources of ploughing in increased funds into R&D activities to introduce new products at a steady pace, observes Transparency Market Research in a recent report. With the view of gaining a better hold on emerging markets with vast, untapped growth opportunities, focus has risen on geographical expansion through strategic collaborations, mergers, and acquisitions of smaller but promising regional players. Some of the leading companies in the market are Koninklijke Philips N.V., SunTech Medical, Inc. (Halma plc), American Diagnostic Corporation, Withings SA, SPENGLER, Healthcare, Welch Allyn, Inc. (Hill-Rom), Schiller AG, Omron Healthcare, Inc. (OMRON Corporation), and GE Healthcare. According to the report, the global blood pressure monitoring devices and accessories market will exhibit a promising 7.0% CAGR over the period between 2017 and 2025. If the numbers hold true, the market is expected to rise to a revenue opportunity of US$3.18 bn by 2025 from $1.75 bn in 2016. Of the key product varieties marketed by the global blood pressure monitoring devices and accessories market, the segment of automatic blood pressure monitors acquired the largest share of revenue in 2016, thanks to the rising demand for reliable and fast devices in the face of the rising patient population globally. 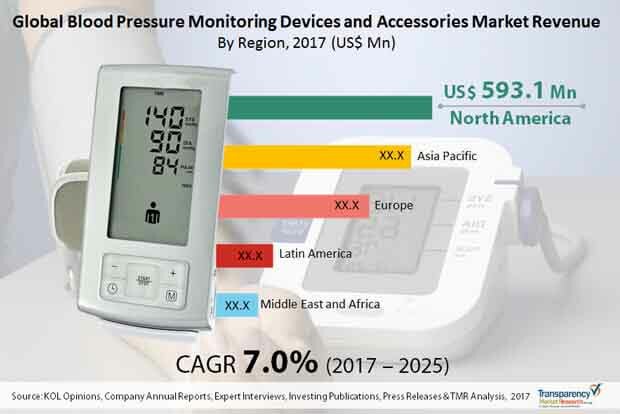 Geographically, the market in North America accounted for the dominant share in the overall market owing to the high prevalence of hypertension and the rising preference of patients to technologically advanced and digital blood pressure monitoring machines. The region is likely to retain its dominant spot over the forecast period as well. A number of factors are spelling growth for the market, including the vast rise prevalence of blood pressure-related conditions across the globe, active role of governments across emerging economies in the steady improvement of healthcare infrastructure, and technological advancements in products. Stressful lifestyles, unhealthy diets, and lack of regular physical activities of people globally, especially across rapidly urbanizing cities in emerging economies, are leading to a vast rise in the prevalence of blood pressure-related issues. As this rising patient-pool becomes more aware about the variety of monitoring devices and accessories available for the effective management of blood pressure-related health conditions, the market for blood pressure monitoring devices and accessories is benefitting. Over the next few years, the market is expected to benefit from the rise in number of companies entering the space of blood monitoring devices and accessories with their innovative interventions. The rising disposable incomes of the global population will make new product varieties more affordable to a larger part of the global population in the near future, thus driving the market.